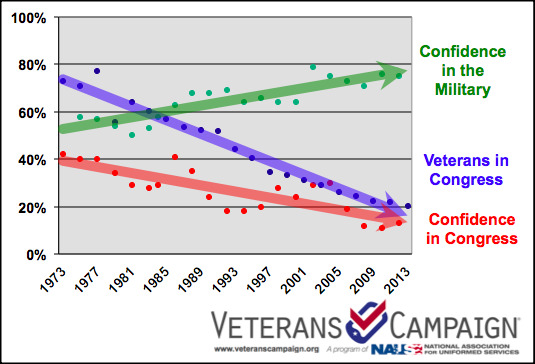 The number of veterans serving in elected office has declined rapidly over the last forty years. In 1969, seventy-five percent of senators and congressmen had served in the military. By the beginning of the Afghanistan War, that number had dropped to fewer than one in three. Even more striking, since 2001, the number has continued to decline steeply. Currently, just over one in five serving senators and congressmen has served. 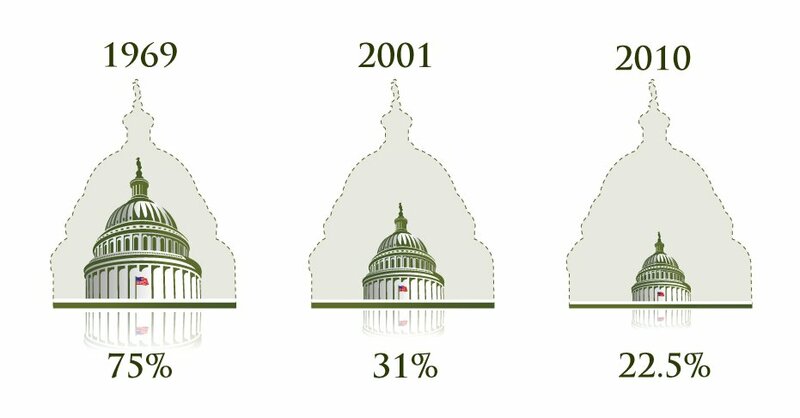 U.S. confidence in elected leaders has similarly decreased. This is likely due to ever-increasing partisanship, corruption, and inability to work together for the common good of the United States. Veterans are a valuable yet untapped resource of superb elected leaders. Military veterans have outstanding leadership experience, have made difficult decisions under pressure, and have accomplished whatever America has asked of them, honorably. As one of the most diverse groups within the United States, they have consistently put their differences aside to work together for the common good. Most importantly, Veterans have demonstrated their willingness to put America and its citizens before their own well-being. We believe that by training Veterans to campaign effectively, more Veterans will run for and be elected to public office. Moreover, Veterans’ common bond of service has historically encouraged bipartisanship, cooperation, and better government. Americans of all ages have tremendous confidence in those who wear the uniform. Studies have shown that Americans have become increasingly confident in the men and women in uniform. Today, the military is the most respected institution in the United States. Eighty-two percent of Americans express confidence in our soldiers, sailors, airmen, and Marines. The confidence Americans have in the military looks likely to continue with the millennial generation (Americans between the ages of 18 and 29), according to a recent Harvard study. Although just two percent have served, millenials have more confidence in the military than they have in the President, the Supreme Court, Congress, the media, the United Nations, and Wall Street. The same study found that by a six to one margin, young Americans believe that politics has become too partisan. Given America’s decreasing satisfaction with congress and increasing confidence in those who wear the uniform, it follows that reversing the decline in the number of veterans serving in public office would increase Americans’ satisfaction with their elected leaders. Veterans are well-prepared to lead, but not to campaign. Veterans face distinctive obstacles in elected politics. Despite bipartisan efforts to recruit veteran candidates, especially in the last three national elections, few non-incumbent veterans have been elected. The amount of time veterans have spent away form their districts while serving, the increasing cost of campaigning, and veterans’ general disillusionment with the political process are all obstacles to veterans who might otherwise make outstanding elected leaders. Veterans generally lack a fundraising base, community roots, and political knowledge and experience. Veterans Campaign’s goal is to demystify the process of running for office, and make it accessible to veterans who are interested in continuing their service as elected officials.